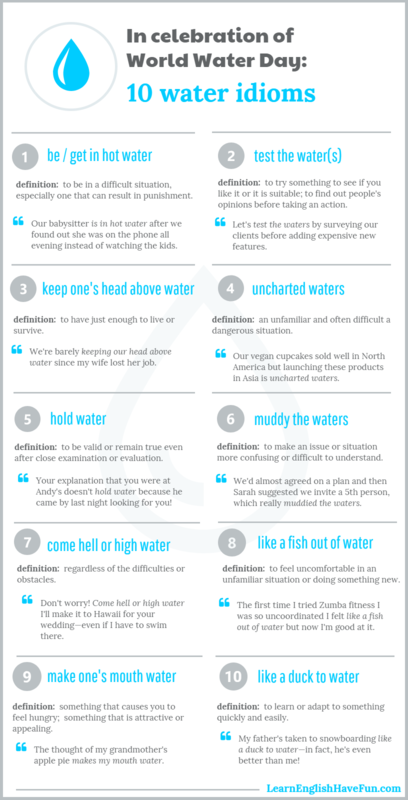 In celebration of World Water Day on March 22, let's learn 10 water idioms. Each of these idioms is common in everyday conversational English so they are worth learning and they will make your English sound natural. be/get in hot water: To be in a difficult situation, especially one that can result in punishment. I'm in hot water because I got home 30 minutes after my curfew. Don't get in hot water for something so stupid as stealing office supplies. We're in hot water because client never signed the contract and they refused to pay for the work already done. test the water(s): To try something to see if you like it or it is suitable; to find out people's opinions before taking an action. Now that our son's a teenager, he sometimes tests the water with us before sharing his ideas with his friends. I'd test the waters with a fundraiser first before launching your political campaign. keep one's head above water: To have just enough to live or survive. Unfortunately, we're not keeping our head above water so we're going to have to close one of our manufacturing plants. I'm barely keeping my head above water at work but I refuse to stay any later at the office and miss my children's sporting events. uncharted waters: An unfamiliar and often difficult or dangerous situation. Dating two women at the same time is uncharted waters for me but my roommate does it all the time. Traveling solo in Africa as a woman was uncharted waters but it was the best thing I've ever done. Now, I'm really confident about doing a lot of other things by myself. hold water: To be valid remain true even after close examination or evaluation. Unfortunately, the hypothesis did not hold water when we tried to replicate the study. None of these conspiracy theories hold water when you examine them closely. muddy the waters: To make an issue or situation more confusing or difficult to understand. I hope everyone stays focused on the items on the agenda and don't muddy the waters with other topics. My mother-in-law is trying to destroy my marriage—Whenever I'm having an argument with my wife, she jumps in the conversation to muddy the waters. come hell or high water: Regardless of the difficulties or obstacles. Come hell or high water I'm going to get that promotion. We have to finish the construction project by August 15th, come hell or high water. If not, the client will sue us for breach of contract. like a fish out of water: To feel uncomfortable in an unfamiliar situation or doing something new. I feel like a fish out of water whenever I have to go to networking events. Look at my dad—he's like a fish out of water trying to play tennis. make one's mouth water: Something that causes you to feel hungry; something that is attractive or appealing. Let's buy one of those cookies, they're making my mouth water. I didn't really want to have dessert but listening to everybody else place their orders made my mouth water and I ordered a slice of cheesecake. like a duck to water: to learn or adapt to something quickly and easily. At first, I was worried about becoming an office supplies salesperson but I took to it like a duck to water. My three oldest children learned to play the piano like ducks to water but my youngest has zero musical talent. Time to practice these water idioms. Select an idiom and write an example sentence. I'll provide feedback on your sentence.